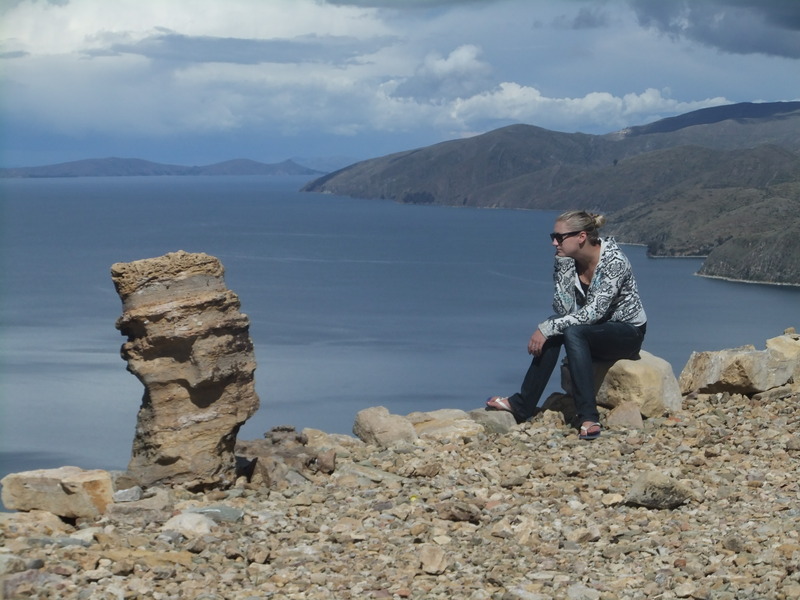 It was a sad moment when we realized the only buses going to Lake Titicaca from Cusco were overnight buses. We tried our best to avoid it, but then once again found ourselves tossing and turning in our seats through the evening. We were woken at 5:30am with a little old woman serving Cinnamon tea out of a big red jerry can and were told our stop was in 10 minutes. When the bus pulled over, only we and the lady with her gas can got off: we were in the middle of nowhere. Just the three of us, dead tired, at quarter to six in the morning on the side of a highway. View from the bus as I woke up. 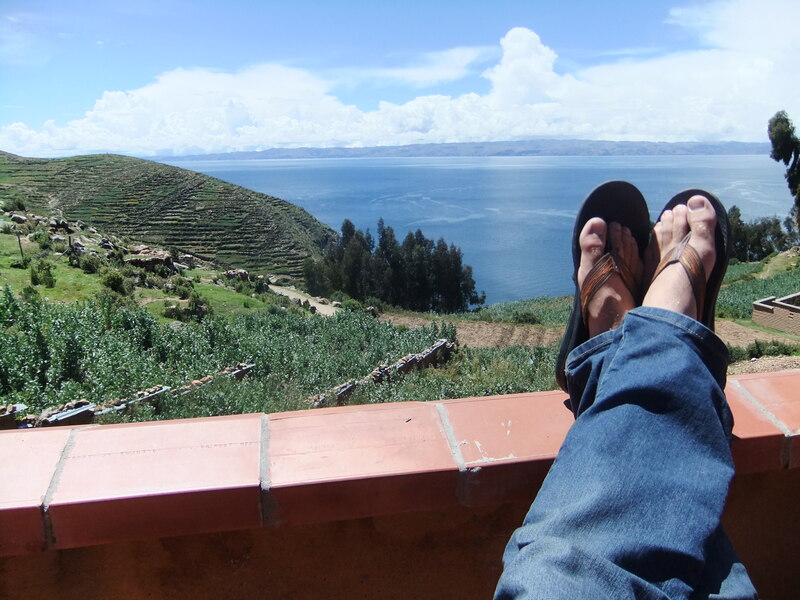 We had decided to skip Puno, the town on the Peruvian side of the lake, because other travelers had said it wasn’t worthwhile. 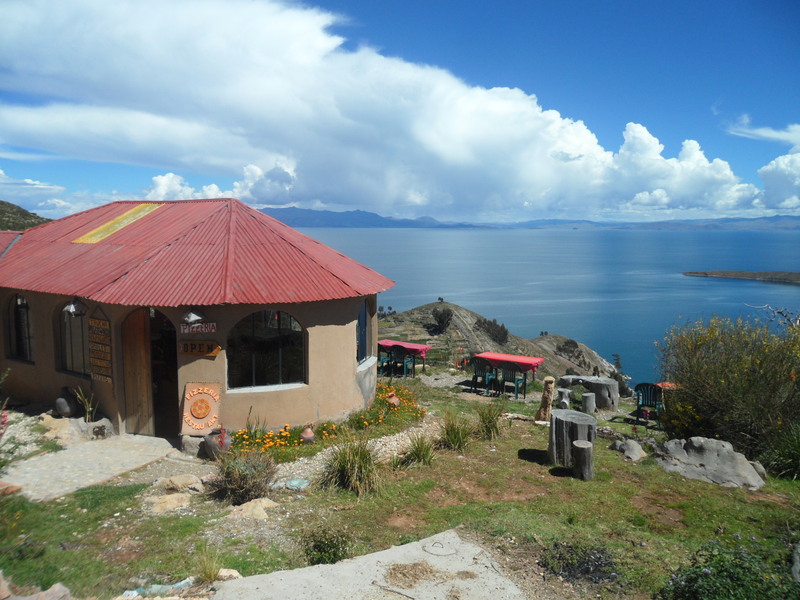 We agreed to have a relaxing time during our stay, and so, opted against staying in Copacabana (the town on the Bolivian side), and went straight for the Isla Del Sol, just an hour and a half boat ride from Copacabana. The trouble was, we now had to make it across the Peruvian/Bolivian border at 6:00am, and we had no clue where we were. Luckily, the woman who got off the bus with us agreed to help; and let me tell you, she was a lifesaver! It took us 2 minibus rides, a taxi, a lot of trouble trying to find an open bank during a holiday, a money exchange center and walking across the border to finally get to Copacabana by 8:00am: probably one of the most productive mornings I’ve had in my life. When we arrived in Copacabana, the place was a zoo. It was Good Friday, and in such a Catholic country, this was a BIG deal to Bolivians. Turns out, every year on Easter weekend, people from all over Bolivia come to Copacabana as pilgrims to camp out in tents and camper vans. The beach was jam packed with families in tents or sleeping in cars and vans. Street vendors were in excess, selling choripan, soup, massive bags of popcorn and roasting giant pigs on the corner of traffic packed streets. The streets and the cars were covered in flower petals of beautiful colours! People had weaved garlands of flowers and laid them on the hoods of their cars in some sort of Easter celebration; as a result, the whole town was covered with flowers. It was a little overwhelming at such an early hour of the day, but we powered through the crowd, bought a ticket to the Isa Del Sol and ate a quick breakfast of choripan from a lady camped out on the beachside. Although I slept most of the boat ride over, I did catch enough to tell you the lake is breathtaking! 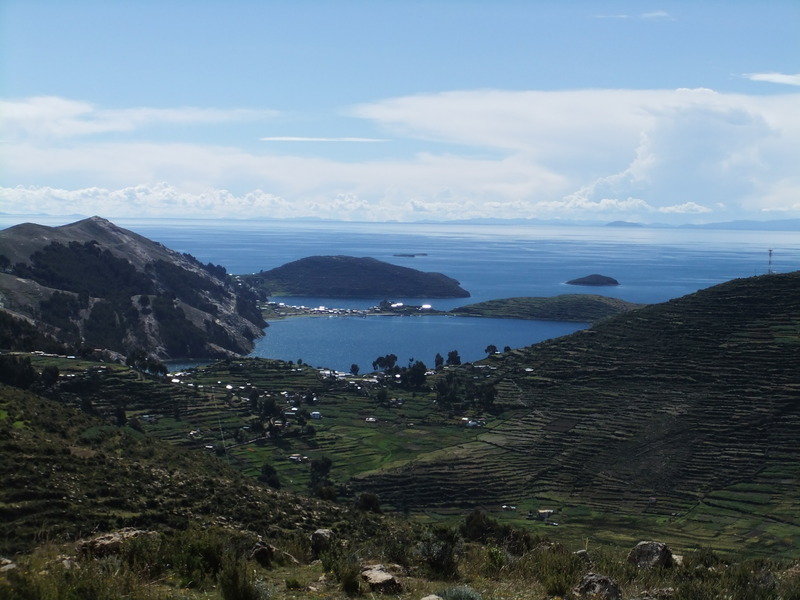 Lake Titicaca is the largest high-altitude lake in the world. It sits at an elevation of 3808m and is an impressive 8400 sq km. The Cordillera Real mountain range sits as a beautiful backdrop to the lake, with peaks that look too low to be covered in snow (although at that altitude they were anything but low!). 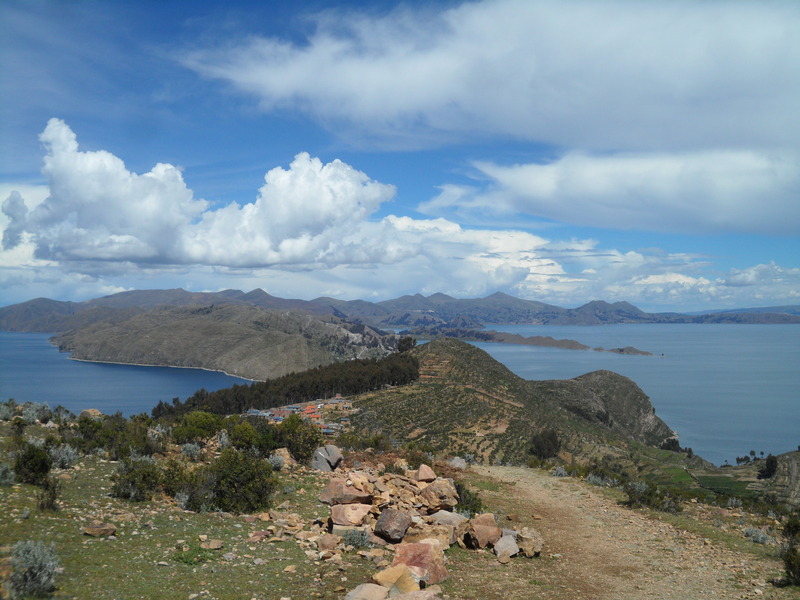 The Isla Del Sol is, according to Incan Mythology, the place where the Sun was born and where Gods came down to Earth and appeared to mortals – and I can see why: the place is magical. 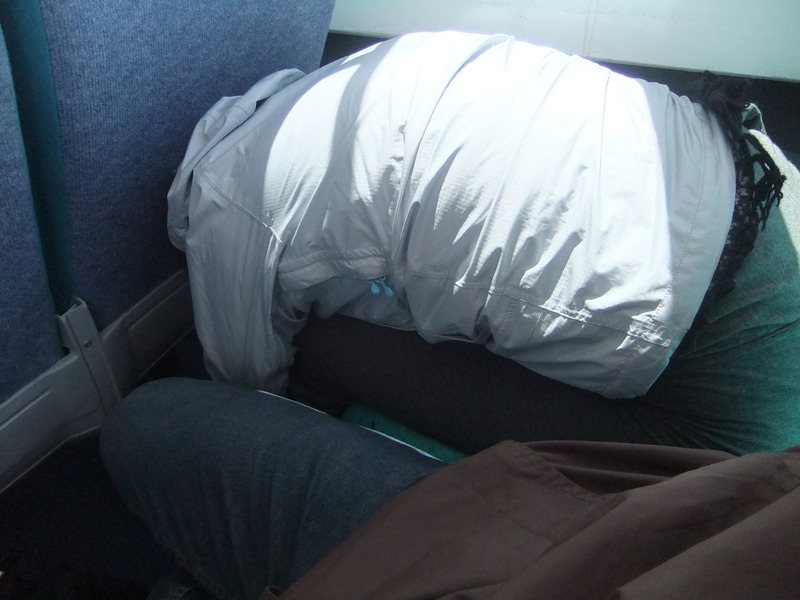 Yes… this is how I sleep on boats. We stayed in a village called Yumani, right in the center of the island. When the boat docked it was a thirty-minute hike straight up uneven, rocky stairs with ALL our bags! I felt like I was back on the Inca Trail again, but somehow I’d become a porter! Once at the top, however, the view was worth it. Every hostel and restaurant had a gorgeous view of the lake. 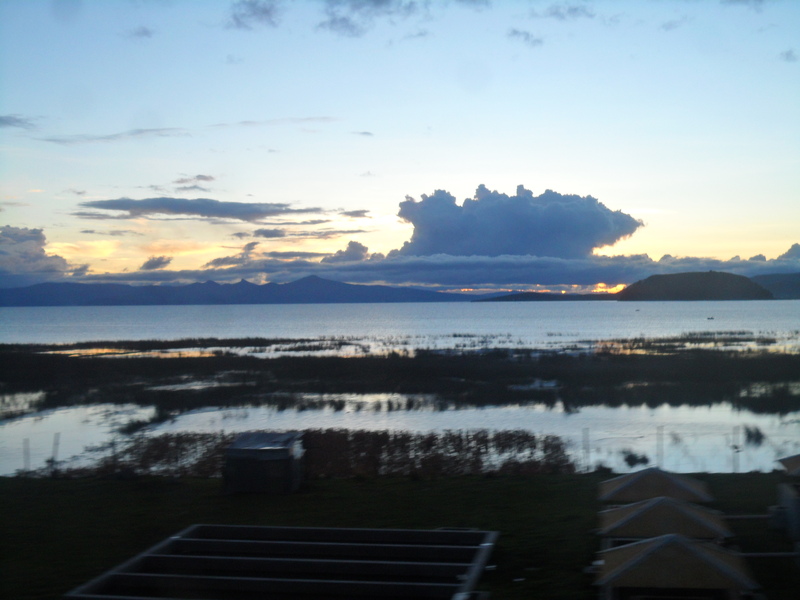 We stayed at an East-facing hostel and could see the Isla del Luna (Island of the Moon) from our bedroom window. Not bad for less than $5 a night and a room to ourselves! We spent the afternoon walking around the Yumani area. It was very basic, but incredibly beautiful. Apart from the hostels and restaurants, the land was pretty barren. 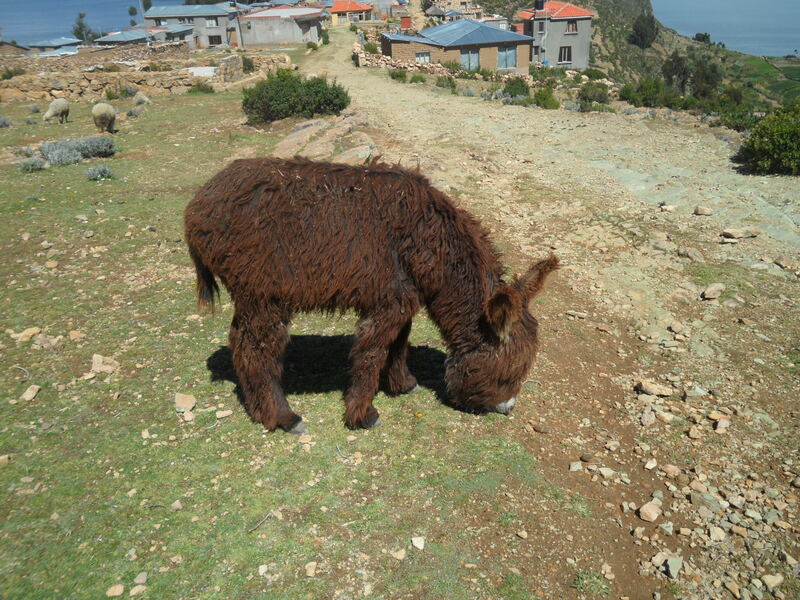 Alpaca’s, pigs and donkey’s roamed the countryside and the locals kept busy working the land or participating in the local soccer match that we could see happening from the top of the hill in the next village over. Once we climbed to the top of the island, it was easy to see how unreal the landscape really was. The water was placid and a perfect deep blue colour. The surrounding islands were green and looked almost uninhabited, and the snow-capped mountain range in the background was stunning. We managed to pick the perfect day for sightseeing, as the sun was shining and there were very few clouds around. You could see forever! 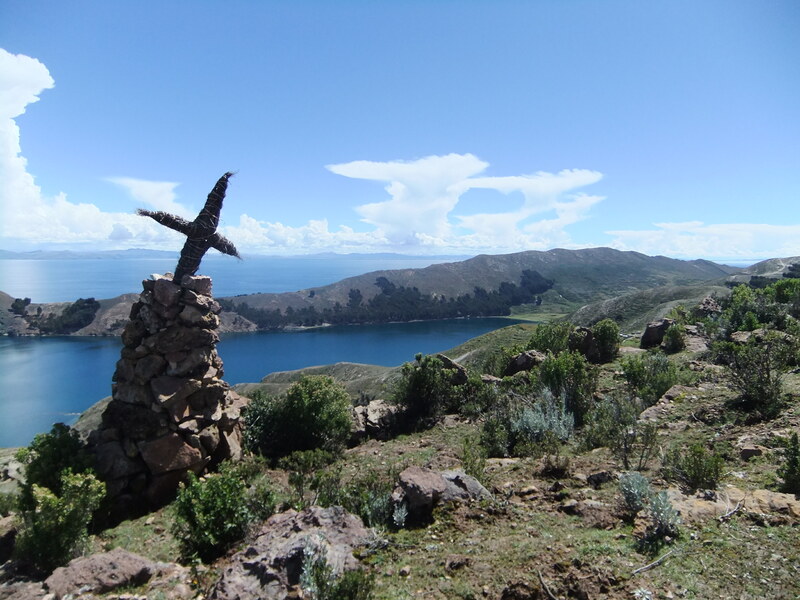 This entry was posted in Bolivia, South America and tagged Copacabana, Isla del sol, Lake Titicaca, Puno, Travel by hilarylust. Bookmark the permalink. Oh WOW! I take it back, THAT would be chaos! Hahaha! Still, I’m jealous, I would LOVE to visit Rome one day!